This cartoon “came to me” when I was vacuuming the house the other day! It’s a comment on all the technological distractions we face these days. By the way, I don’t think God is opposed to the tech we have… he invented it for us, after all! And I’m not opposed to the wonderful technology we have – I use a PC to colour my Bible Cartoons, I have a mobile phone, enjoy iTunes & iPod music, watch flat screen TV, etc. I’m not a Luddite *1, honest! 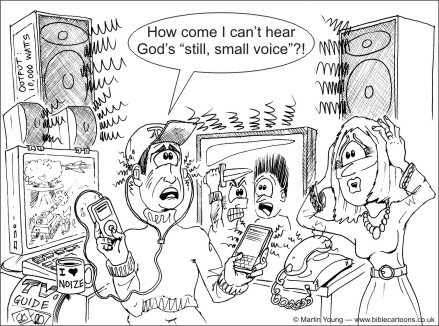 This cartoon is only a comment on the POTENTIAL these bits of tech have to distract us, particularly when it comes to listening, & ESPECIALLY when it comes to listening to God. 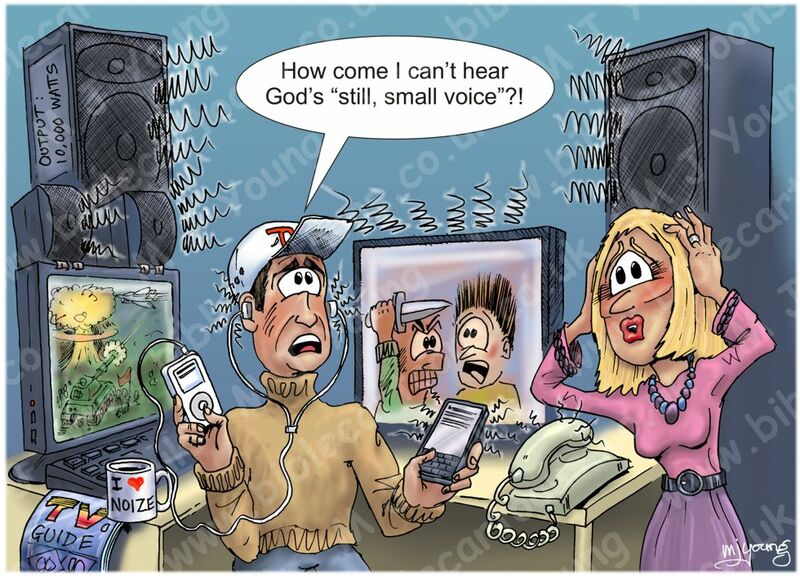 All I’m trying to point out in the cartoon above is that distractions come in all shapes & sizes; loads of things can really benefit us, or really distract us, from hearing God’s still small voice… if we let them. My cartoon is focussing on technological distraction, but just about anything can distract us, if we let it: people, situations, relationships, interests, hobbies, work, money, etc. And I am specifically calling to attention the potential distraction that technology can cause when it comes to Christian’s listening to God. broadly : one who is opposed to especially technological change. And He [God] said, “Go out and stand on the mount before the Lord”. And behold, the Lord passed by, and a great and strong wind rent the mountains and broke in pieces the rocks before the Lord, but the Lord was not in the wind; and after the wind an earthquake, but the Lord was not in the earthquake; And after the earthquake a fire, but the Lord was not in the fire; and after the fire [a sound of gentle stillness and] a still, small voice. When Elijah heard the voice, he wrapped his face in his mantle and went out and stood in the entrance of the cave. And behold, there came a voice to him and said, What are you doing here, Elijah?